West Bromwich Albion (342), Arsenal (70). Joined West Brom straight from school, signing professional in 1952. A right back, he played for the Baggies 342 times in the Football League. He won 23 full international caps for England, and played in all three group games in the 1958 World Cup Final tournament in Sweden. In April 1964 he transferred to Arsenal for a fee of £45,000. The A&BC Chewing Gum 1966/67 card notes 'A strong tackling full back... Don had the misfortune to break a leg playing for Arsenal last season. Recovered in time for the start of the 1966-67 season, and shows signs of regaining his place in the first team', but alas it was not to be and aged 31 he transitioned into coaching. He held various managerial and coaching roles over the next 30 years, being described by Arsenal legend Bob Wilson as 'one of the greatest ever coaches in football'. Brentford (83), Fulham (276). Most of us who were boys in the 1960s will remember Jimmy Hill as Head of Sport at LWT, a position he held from 1968 until 1972, before he moved to the BBC to present MoTD, staying with the BBC until 1999. His playing career had begun with Brentford in 1949, moving to Fulham in 1952. 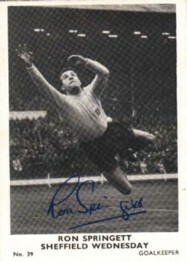 He made 276 League appearances for Fulham, retiring in 1961. While still a player, and aged only 29, he became chairman of the Professional Footballers' Association. You can relive a small part of Jimmy's life by watching this YouTube clip of his emergency linesman role from September 1972: https://www.youtube.com/watch?v=ntfslrhajAg. Sheffield United (576). Hodgkinson signed for Sheffield United in August 1953, and retired as a goalkeeping coach in 2012 after almost 60 years of active involvement in the game. He made 576 League appearances for his only club, plus 5 international appearances for England, playing in his final League game in 1970. He was in England's squad for both the 1958 and 1962 World Cup Final tournaments. Newport County (111). Newport County player in three separate spells. Also captain of non-league Hereford United in their 1972 F.A. Cup giant-killing run. Liverpool (274). Born in Liverpool, he came through the youth system and then made 274 League appearances for the Reds. Byrne won a Second Division Championship medal, plus two First Division Championships and a 1965 F.A. Cup Winners medal. He made two appearances for England, one in 1963 and another in 1966 and was part of the 1966 World Cup squad so was awarded a World Cup medal in 2009. He was described on football cards as a courageous, marauding left back. Manchester City (47), Stockport County (60), Halifax Town (132) Manchester-born midfielder who signed professional for City in June 1958, aged 16. Stayed for 7 years before a move to Stockport County. Liverpool (24), Portsmouth (64), Aldershot (5). 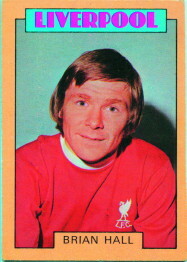 Liverpudlian who made a number of appearances for Liverpool before a move to Portsmouth. 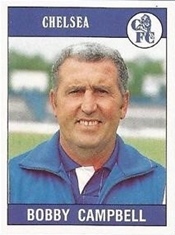 After a total of 93 League appearances he moved into coaching and then management with Fulham, Portsmouth and Chelsea. Newcastle United (3), Darlington (442). North-East man who worked at Easington Colliery before signing professional with Newcastle in 1952. 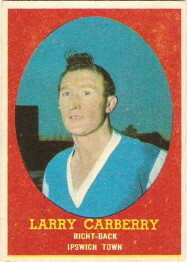 Made his League debut in the First Division in 1953. Signed for Darlington at the start of the 1955/56 season. 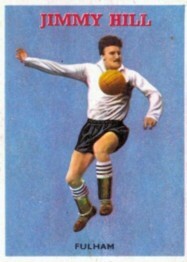 Broke his leg in 1958 but stayed with Darlington for 12 years, setting the club's appearance record. Regarded as a true legend of the Darlington Football Club. Hibernian (61), Rangers (59), Millwall (2), St.Johnstone (41). 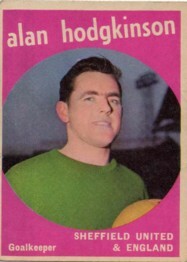 Signed professional with Hibs as a 20-year old in 1969. Made 61 Scottish League appearances in a 4-year stay before a move to Rangers. Won League Championship and Scottish Cup medals in 1975/76 and a League Cup medal in 1977/78. Made 59 League appearances with Rangers before a move to Second Division Millwall in time for the 1978/79 season. Made one full appearance and one substitution at Millwall before his contract was cancelled after only 5 months. Returned to Scotland to play for St. Johnstone. Preston North End (104), Everton (233), Birmingham City (115), Stoke City (82), Blackburn Rovers (79). Joined Preston North End as a 15-year old, turning professional at 17 and appearing at that age in the 1964 F.A. Cup Final. Stayed almost 4 years at Deepdale playing in a mid-table Second Division side before a transfer late season transfer to Everton in 1966/67. In the following seasons Everton finished 5th, 3rd then Champions in 1969/70. Kendall, Alan Ball and Colin Harvey were known as the 'Holy Trinity' for their midfield prowess at the Toffees. After spells with Birmingham City and Stoke he turned to management where he again won the First Division title with Everton in 1984/85 and 1986/87. A man who brought great credit to the game and who will be sadly missed by all football fans. Crystal Palace (3), Plymouth Argyle (6). Palace youth-team player who won the F.A. Youth Cup in 1977 and 1978. Signed professional in February 1976 and made his League debut twelve months later. Stayed at Palace two and a half years but never quite cracked the big time. Moved on to Plymouth before moving to non-League football. Motherwell (464). Joe Wark was born in Glasgow, joining Motherwell in the 1968/69 season as they romped to the Second Division title with a very impressive 30-4-2 record with 112 goals for, 23 against. He remained with the Wells for his entire career over 16 seasons, for a total of 469 League appearances. 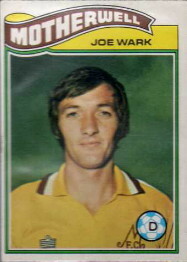 The term 'club legend' certainly applies to Joe Wark. Manchester United (45), Plymouth Argyle (152). Republic of Ireland goalkeeper joined Manchester United in May 1964 from Shamrock Rovers. Won the 1964/65 First Division League title with the Red Devils but lost his place in the team and with Alex Stepney secure in goal Dunne moved on to Plymouth Argyle in February 1967. Had a successful spell with Argyle before returning to Ireland to re-join Shamrock. Joe Wilson joined Workington in the Third Division (North) in January 1956. A tough full-back he remained in the Fourth Division until March 1962 when he was transferred to Nottingham Forest in the First Division after impressing in a Cup tie. He played First Division football with Forest for 3 years, making 84 League appearances before a late season transfer to struggling Wolves in 1964/65, though not able to save them from relegation. He had two seasons with Wolves, making 58 League appearances and helping them to promotion back to the top Division in 1966/67. At the age of almost 30 he accepted a move back down to the Fourth Division to join Newport County. After one season there he went back to his home town of Workington where he finished his career with another 169 games. He retired with over 500 League appearances, quite a feat for a tough tackler. In 1973 he emigrated to Australia, where he remained until his death. Pictured here from the Workington team photo from 1971/72. QPR (133), Sheffield Wednesday (345). Brilliant goalkeeper who began his career with QPR in 1953, making 88 League appearances before a transfer to Sheffield Wednesday in March 1958. He gained his first England cap in 1959 and played in all four games in England's campaign in the 1962 World Cup in Chile. He went on to make a total of 33 international appearances, making way eventually for Gordon Banks. After 345 League appearances for Sheffield Wednesday he was transferred back to QPR in 1967 in an unusual transfer swap with his brother Peter. Aberdeen (109), Fulham (254), Birmingham City (16), Rotherham United (16). Born in Aberdeen, Leggat won the Scottish League in 1954/55 and the League Cup in 1955/56 with his local team. He made his full international debut against England in April 1956. At the start of the 1958/59 season he transferred to Fulham in the Second Division, helping them to promotion at the end of that season. Although frequently struggling towards the foot of the table, Leggat, playing alongside Johnny Haynes, enjoyed an 8-year spell at Craven Cottage, ending with a total of 254 League appearances. He was selected for the 1958 World Cup in Sweden, playing in the first two group games. His last international appearance was in 1960, giving him a total of 8 caps. Aged 37 he moved to Canada where he was inducted into the Canadian Soccer Hall of Fame in 2001. Liverpool (1), Crewe Alexandra (436). Tommy Lowry joined Liverpool as a 16-year old, signing professional terms two years later. A defender, he made a single appearance for Liverpool on the final day of the 1964/65 season. 12 months later he moved to Fourth Division Crewe, helping them to a 5th place finish in 1966/67. The following season they were promoted from a 4th place finish, but were relegated back down to the Fourth in 1969. Lowry remained with Crewe for the next 8 years, finishing his League career with a club record 436 League appearances. He never appeared in a solo football card in the 60s or 70s, this image is taken from the 1971/72 Daily Mirror 'My Club' Crewe Alexandra team card. Albion Rovers (25), Ipswich Town (207), WBA (14), Wolverhampton Wanderers (53), Sunderland (6). Born in Scotland, Hegan played for Albion Rovers making 25 Scottish League appearances before a transfer to Sunderland as an 18-year old. In a 2-year stay with the Black Cats he didn't make a League appearance but then transferred to Ipswich Town where he was a hit. Over a 6-year period he made over 200 League appearances before a move to WBA then Wolves. The Top Sellers Football 72 Wolves card describes him as a 'bustling midfield player who can also operate on the wing'. Despite his birthplace, Hegan won his first international cap with Northern Ireland in 1970, going on to gain 7 full international caps. WBA (40), Crystal Palace (16), Peterborough United (118), Swansea City (178). Tony Millington signed professional with West Brom in 1960 aged 17. Over the next four seasons he made 40 League appearances for the Baggies in the First Division. In 1964 he transferred to Second Division Crystal Palace, then towards the end of the 1965/66 season moved to Third Division Peterborough United. At the start of the 1969/70 season he transferred to Fourth Division Swansea, helping them to promotion that season. He finished his League career with 352 League appearances. He won his first international cap for Wales in 1962, going on to appear for his country 21 times. His final international appearance was in November 1971. Preston North End (238), Blackburn Rovers (221), Barrow (148). Fred Else joined Preston North End as a 16-year old, signing as a part-time professional aged 18, but didn't become a regular in the side until his early 20s. He went on to make 238 League Appearances for PNE at a time when they once again became one of the top teams in Division One. However, the good times didn't last and when Perston were relegated in 1961 Else stayed in the First Division with a move to Blackburn Rovers. He stayed for five years, racking up another 221 League appearances before relegation for Rovers in 1966 prompted Else to join Fourth Division Barrow where he would become their manager. A total of 607 League appearances, for man described as a gentleman who was perhaps unlucky not to be given an international cap. Liverpool (153), Plymouth Argyle (43), Burnley (51). Fred Else joined Preston North End as a 16-year old, signing as a part-time professional aged 18, but didn't become a regular in the side until his early 20s. He went on to make 238 League Appearances for PNE at a time when they once again became one of the top teams in Division One. However, the good times didn't last and when Perston were relegated in 1961 Else stayed in the First Division with a move to Blackburn Rovers. He stayed for five years, racking up another 221 League appearances before relegation for Rovers in 1966 prompted Else to join Fourth Division Barrow where he would become their manager. A total of 607 League appearances, for man described as a gentleman who was perhaps unlucky not to be given an international cap. The 1978/79 Sun Soccercard says "Fine attacking midfield player who could play also in attack in club or international football. European Footballer of the Year in 1962. Czechoslovakia first capped Josef in 1954 and he went on to win 63 caps for his country. Played in the 1958 and 1962 World Cup Finals...'. He scored first in the 15th minute of the 1962 World Cup Final against Brazil in Chile, though Czechoslovakia went down 3-1. Ipswich Town (257), Barrow (17). Turned professional with Ipswich in 1956, staying for 10 years in the spell which saw Ipswich win the Third Division (South) Championship, the Second Division title in 1960/61 then the First Division in 1962/62. Birmingham City (87). The Top Sellers Football 73 card says "Lively winger who was born in Stockton-on-Tees but made his name in Birmingham, for whom he has made some 100 appearances". He played the first part of his career with Birmingham City in the First Division as they flirted with relegation in 1962/63 and 1963/64 before succumbing in 1964/65. He played the remainder of his career in the Second Division, being part of the squad that won promotion back to the First Division in 1971/72 but retiring in that season after being given a free transfer by the Blues. Dennis Thwaites and his wife were killed in the terrorist attack in Tunisia. The Sun 1978/79 Soccercard says "At the start of his career, Zito played in several positions for his club, but he became a hard-working midfielder who went on to win 53 caps for Brazil. Won World Cup winning medals with his country in 1958 and 1962. Retired from the game after he played well over 700 games in his playing career with two clubs in Brazil". Dublin-born Fullam joined Preston North End in the First Division in 1958. At the time PNE were still one of the top teams in the League. He stayed in England for 3 years, making 49 League appearances, before returning to Ireland to play for Shamrock Rovers, Bohemians and Athlone Town. Over a 19 year playing career he made over 400 appearances in the League of Ireland. He won 2 League of Ireland titles, an amazing 8 FAI Cup winners medals, and played 11 times for the Republic of Ireland. 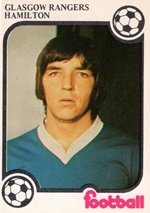 His only appearance in English football cards was the 1975/76 FKS album under 'Stars of Ireland and Wales' where he was featured as the left hand-side of the sticker with Pat Byrne (though under the name Johnny Fulham). Rangers (341), Morton (8), Partick Thistle (19). Defender who joined Rangers as a 16 year-old, and went on to make 341 League appearances over the next 19 years. Won a total of 11 League and Cup titles, and made 8 international appearances for his country. The 1978/79 Sun Soccercard notes 'Dominating centre back for Glasgow Rangers. 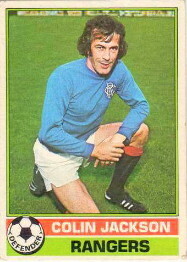 Colin is also the Ibrox Park's longest serving player having joined Rangers in October 1963 from Aberdeen Sunnybank. But it was not until the 1970s that he was established in the first team. Now he is a regular in the side that carried all before them in the 1977/78 season'. Luton Town (36), Everton (195), Q.P.R. (30), W.B.A. (25), Wolves (28), Aldershot (36). 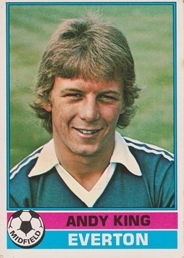 The 1977/78 Topps Chewing Gum 'red back' card says 'Andy made his debut as substitute in the last game Luton played in Division One before being relegated in April 1975. Soon won over the Everton fans following his £35,000 transfer in April 1976 when he scored twice at Derby in his third game for Everton'. He went on to make 151 League appearances for Everton before a move to QPR at the start of the 1980/81 season. He later played for WBA, Wolves and Aldershot, finishing with 310 Football League appearances, before moving into management. Queen of the South (112), Preston North End (98), Coventry City (47), Torquay United (2), Morton (32), Raith Rovers (5). Glaswegian who signed professional aged 18 with Queen of the South, teaming up with Neil Martin to secure promotion back to Division One in his first season. Joined Second Division Preston North End at the start of the 1964/65 season. Transferred to newly promoted Coventry City in Division One for the 1967/68 season, a season which saw Coventry struggle and miss the drop by one point, a feat they repeated the following season. After two seasons with Coventry Hannigan joined Torquay, then returned to Scotland. In the 1970s he migrated to Western Australia and as a player and coach became one of the legends of the game in that State. Sheffield United (536). Sheffield-born lad who signed professional with United as an 18 year old, making his League debut in the 1964/65 season. Woodward stayed for 15 seasons, making 536 League appearances for the Blades, scoring 158 League goals in that time. Sheffield United were relegated from Division One at the end of the 1967/68 season, but promoted back again after two years in Division Two. In the nine seasons from 1968/69 to the end of the 1975/76 season when they were relegated again Woodward missed only 8 League games, a phenomenal record. Former teammate Tony Currie is quoted as saying "Woody was exceptional, he had that rare gift of knowing exactly when to run, when to shoot and where to go to receive the ball. We had a telepathy out there on the pitch and instinctively just seemed to know what the other was going to do". Charlton Athletic (495). John Hewie was born in South Africa to expat Scottish parents. In 1949, when he was 21, he signed professional with Charlton Athletic, and stayed with the club for the next 17 years, making 495 League appearances. In 1953 he was selected to play for the Scotland B side for a game in Edinburgh, requiring him to set foot in Scotland for the first time. 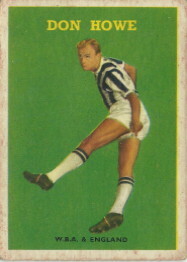 He went on to earn 19 full caps for his country, including two games in the 1958 World Cup Finals tournament in Sweden. Burnley (38), Southampton (197). The Top Sellers Football 72 card notes "Tall, strong-kicking Walker was born at Colne, Lancashire and joined nearby Burnley. Transferred to Southampton in 1964 he is usually found in the back four but can play in midfield and has worn both No. 10 and 11 shirt". In his five years with the Clarets Walker made 38 League appearances at a club that was often near the top of the First Division, famously winning the title in 1959/60. In May 1964 he joined Second Division Southampton, and helped them gain promotion in 1965/66. He stayed with the Saints for 10 years, making a total of 197 League appearances. 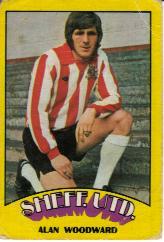 His contract was cancelled at the end of the 1973/74 season as the Saints were relegated back to the Second Division. 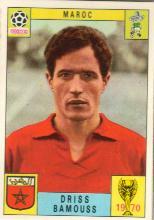 Played for Morocco at the 1970 World Cup Finals tournament. The FKS Mexico 70 album notes "Brains of the side and captains both his club FAR and the national side. Alert organiser of attacks, who also lines up as a double spearhead. Is a 27 year old Army officer and product of French military academy Saint Cyr". According to Wikipedia he later went on to organise the 1988 African Cup of Nations held in Morocco, and to also be a Brigadier General in the Royal Moroccan Gendarmerie. WBA (26), Charlton Athletic (149), Swindon Town (55), Preston North End (58), Oldham Athletic (3). Republic of Irishman who signed professional terms with First Division West Brom as an 18-year-old. He made 5 League appearances for the Baggies over two and a half years before a mid-season transfer to Second Division Charlton Athletic in 1968. In his first season there Charlton narrowly missed promotion, finishing 3rd. In the following two seasons they narrowly missed relegation, finishing 20th in both seasons. In 1972 they couldn't avoid the drop, and at the end of the season Treacy moved to Swindon to stay in the Division. He stayed there for 18 months before a move to Preston in 1973/74, a season that saw both Swindon and Preston relegated to the Third Division. In 1976/77 Treacy returned to WBA in the First Division, making 21 League appearances in a season that saw a 7th place finish. 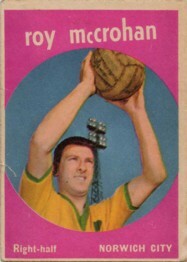 As a Republic of Ireland international Ray Treacy appeared 42 times from his debut in 1966 until his final appearance in 1977. Blackpool (131), Cardiff City (90), Wrexham (32), Barnsley (113), Birmingham City (2). Signed professional as a 17-year-old with Second Division Blackpool in February 1974, making his League debut the following season. Stayed with the Tangerines for five and a half seasons, during which time they mostly competed towards the top of the Division. In 1977/78 Blackpool slipped into relegation, with Ronson playing one season in the Third Division before a transfer back up into the Second to join Cardiff. The 1978/79 Topps Chewing Gum orange back card suggests that Ronson was short, at 5' 6", describing him as a creative midfielder who was liable to come up and score some valuable goals. He later moved to Wrexham, then Barnsley, Birmingham City on loan and then back to Blackpool. He ended his English playing career with 385 League appearances. He moved to the US where he racked up another 300+ appearances in their indoor and outdoor leagues. The 1978/79 Sun Soccercard notes: 'Creative midfielder now in his fifth season for the Blackpool club since joining them as an apprentice. Attacking type of player who likes to come forward and score goals. Billy played his 100th League game for the club at Bloomfield Road on 16th September 1978 against Walsall'. Manchester City (181), Stoke City (3), Oldham Athletic (121). The FKS 1968/69 sticker notes "Developed through the club's youth sides and gradually groomed as a successor in goal to Trautmann. Turned to the paid ranks at 21 in July 1960 having been an amateur previously. Agility and courage have been his main assets". Dowd went on to make 181 League appearances for City, and won an F.A. Cup winners medal for their 1-0 win over Leicester in the 1968/69 final. 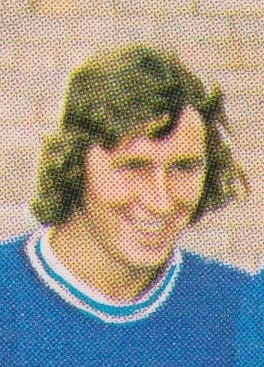 Having lost his team place to Joe Corrigan, Dowd went on loan to Stoke City before a December 1970 transfer to Fourth Division Oldham Athletic. In 1970/71 Oldham won promotion to the Third Division followed by a 4th place finish in 1973, then promotion to the Second Division as champions in 1974 (by which time Dowd had left the club). He made 121 League appearances for Oldham, leaving League football at the age of 35. Arsenal (10), Huddersfield Town (164), Hull City (147), Halifax Town (32). Glasgow-born McGill signed with Arsenal as an 18-year old in 1965. He made 10 first team appearances over two years before a move to Second Division Huddersfield Town. 14th in his first season, 6th the following, then promotion as runaway champions in 1969/70. The 1971/72 A&BC Chewing Gum purple-back card notes 'A great inspiration at Leeds Road, McGill joined Huddersfield from Arsenal, and his experience helped guide the Yorkshire club back to the First Division. A dynamic midfield performer with a strong shot, McGill has scored some spectacular goals, but is generally regarded as a goal-maker'. At the start of Huddersfield's second season back in the top flight McGill left, having made 164 League appearances, to join Hull City in the Second Division. He played with Hull for over four years, making 147 League appearances before trying (unsuccessfully) to help Halifax avoid relegation from the Third Division in 1975/76. Recorded as being only 5' 8" tall, McGill was one of those deep-lying pocket dynamo midfielders, able to make incisive passes through to the forwards. Clyde (196). 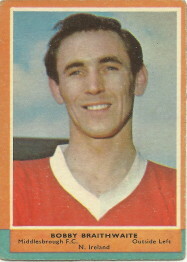 Full-back who played for Clyde from 1963 until 1972, making a total of 196 League appearances, many as club captain. Clyde were in the Scottish Second Division in 1963, but were promoted to the top division in 1964. In 1966/67 they finished third in the Scottish League, behind only Celtic and Rangers, and were defeated by Celtic in the semi-final of the Scottish F.A. Cup. The 1971/72 A&BC Chewing Gum Scottish purple-back card noted "Was out of football for 18 months with a broken leg but came back to prove he is the best full back on Clyde's playing staff. Only missed one first team game during season 1970/71. Signed in 1963 from Clydeside junior club Benburb. Works as a solicitor's clerk". Also appeared in the 1970/71 A&BC Scottish green-back card series. Reading (4), Norwich City (385), Colchester United (75), Bristol Rovers (10). Signed professional terms with local Third Division (South) side Reading in 1949 in a season where Reading finished second but were not promoted. Made four League appearances in two and a half years before a move to Norwich City in the same Division at the start of the 1951/52 season. Played throughout the 1950s, including the poor last place in the Third Division (South) in 1957, followed by a rapid rise including an F.A. Cup semi-final in a replay in 1959 (while in the newly formed Third Division), followed by second place and promotion in 1960. In 1961 Norwich City finished 4th in the Second Division, and in 1962 won the second-ever League Cup with a 4-0 aggregate win over Rochdale, McCrohan playing in both legs. Soon afterwards McCrohan moved back down to the Third Division to play with Colchester, before finishing his League playing career with Bristol Rovers. Made a total of 474 League appearances in a career where he is regarded as a Norwich City legend. Hearts (135), Tottenham Hotspur (268), Derby County (122), Swindon Town (26). 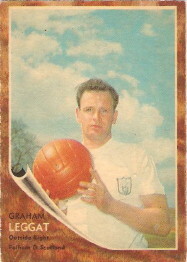 Scotsman who began with Hearts in 1953, winning the Scottish F.A. Cup in 1956 and the Scottish First Division title in 1958 with Mackay as captain of the side. Signed by Tottenham in March 1959, he helped Spurs go from 18th that season to 3rd in 1960, then the famous League and Cup double in 1960/61. 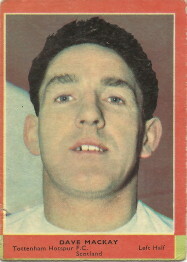 Mackay stayed at Tottenham for over 9 years before Clough and Taylor convinced the 33-year old to join Second Division Derby County at the start of the 1968/69 season. In his first season with the club they won the Second Division title, followed by a 4th place finish in the First Division in 1970. After three seasons with Derby Mackay moved to Swindon Town where he ended his playing career. In total he made 601 Scottish and English League appearances, picking up 22 caps for Scotland along the way. 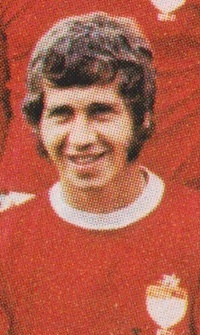 He moved into management, winning the 1974/75 First Division title with Derby County. One of the true greats of the game who will be sadly missed. Kilmarnock (224). Defender who began and ended his career with Kilmarnock, beginning in 1961 in the Scottish First Division. Kilmarnock at that time were high flyers, finishing 2nd in 1963 and 1964, before winning the title in 1964/65, a tremendous achievement. King finished his professional playing career in 1971, having made 224 League appearances. Perhaps partly as a result, Kilmarnock were relegated from the top flight in 1972/73. Sunderland (99), Leicester City (6), Mansfield Town (69), Hartlepool United (60). 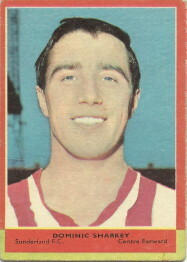 Nick Sharkey signed as a professional with Sunderland aged 17 in 1960, making his League debut five days later in the Second Division. Sunderland finished third in the Division in 1961/62 and 1962/63, before going one better in 1964 winning promotion to Division One. 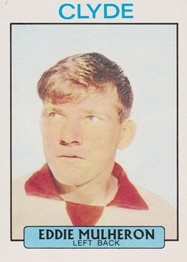 The 1966/67 A&BC football card notes 'A clever inside forward with a powerful shot, Dominic has been with Sunderland throughout his career and has attracted the attention of several "big" clubs during the past few seasons. Although he played in only 15 first team games last season, he should find a regular spot easier to come by this year'. After six years with the Black Cats, and 99 League appearances Sharkey transferred to fellow First Division club Leicester City, but he stayed only 15 months before moving to Third Division Mansfield Town. A Scottish Under-23 international, Nick Sharkey was a prolific goalscorer who finished his career with 234 League appearances. Manchester City (168), Brighton & Hove Albion (83), Crystal Palace (38). Signed as a professional with First Division Manchester City in 1948, though didn't make his League debut until he was a 21 year old, at a time when City were struggling. Little was part of the improving side using the Revie Plan (http://en.wikipedia.org/wiki/Revie_Plan), and made it through to the 1955 F.A. Cup Final (losing 3-1 to Newcastle United) and again the following year (defeating Birmingham City 3-1), gaining a Cup Winners medal. Little stayed at Manchester for nine years, departing for newly promoted Second Division Brighton in 1958, staying for a couple of years before a move to Crystal Palace. 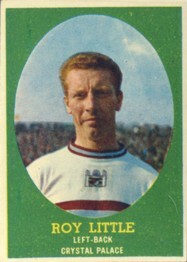 Roy Little played a total of 289 times in the Football League. Burnley (44), Oldham Athletic (95), Bury (49). Ian Towers signed professional for high flying First Division Burnley as a 17-year old in October 1957. 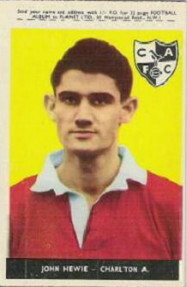 Burnley won the First Division title in 1960, but it was not until the 1960/61 season that Towers made his League debut. In 1962 he was 12th man for the F.A. Cup Final loss to Tottenham (though at the time substitutes were not able to be used). He stayed with Burnley for over 8 years, making a total of 44 League appearances before a January 1966 transfer to Third Division Oldham Athletic. He played for Oldham for two and a half years, making 95 League appearances, before moving back up to the Second Division to join newly promoted Bury for the 1968/69 season (though unhappily they went straight back down). After three years with Bury he moved to South Africa. Towers is pictured from the 1965/66 Typhoo Tea Burnley card. Newcastle United (30), Coventry City (99), Oxford United (66), Darlington (173), Halifax Town (52). Signed professional for First Division Newcastle United in 1957 as a 17-year old, making his League debut two years later, and staying for four more years, making 30 League appearances, though suffering relegation in 1961. In December 1962 moved to 3rd Division Coventry City for £10,000, helping them to promotion as Division champions in 1964. In March 1966 Hale moved back to the Third Division with Oxford United where he stayed for two years before a move, aged 29 to Fourth Division Darlington. Made 173 League appearances for Darlington, becoming their captain and then their manager in 1972 for a brief spell. Featured in the 1971/72 Sun Soccer stamps number 384. Manager of Hartlepool United in the Fourth Division from 1974 until 1976.